When we formed Redline Guiding we wanted to be different, and to go above-and-beyond when it comes to caring for our guests. That’s why we came up the “Ready Pack” concept. Which, by our definition, is a complete day hiking pack to include high quality, seasonally-rated outer- and mid-layer-wear, emergency items, traction and other seasonal essentials, even food and water, all put into a comfortable well fitted 45-liter pack — and all at a very low price point to encourage use. BD Hot Forge hybrid midlayer. Poncho or Mountain Hardware hardshell set. Whistle (attached to pack strap). Food for the day, plus extra. Water for the day, plus extra. BD trekking poles with full grips. All in a compactor-bag-lined modified 45L Ozark pack with integrated cover. Including food and water the cost of our normal Ready Pack is $45/person/day. Without our food and water rations the cost drops to $30/person/day. This is a great deal considering the hundreds of dollars worth of quality gear contained within. The combined weight of this gear, including the pack itself, food, and water, is only 14 pounds (between 9-10 pounds without food and water). The weight is calculated based on the XL-sized kit. It is really worrisome when we see people on Mt Washington and they lack proper clothing, especially if they’re in a guided group. We wanted to make sure we’re never that group and have gone to great lengths to protect our guests from the sometimes unimaginable cold that grips that mountain in the winter and the winds that scour its barren tundra. It’s a small but mighty wasteland and it commands respect. People love that, and we want them to be safe seeing it firsthand. Black Diamond Cold Forge parka. Mountain Hardware hardshell pants and jacket. Outdoor Research overmitts with liners. Light hiking gloves, too, for five useful combinations. Hot packs (some like them). MSR mountaineering snowshoes, if needed. BD rock helmet, under some conditions. Including food and water the cost of our Alpine Ready Pack is $75/person/day. Without our food and water rations the cost drops to $60/person/day. This is a great deal considering the value of quality gear contained within is over $1000. The combined weight of this gear, including the pack itself, food, and water, is less than 24 pounds (between 18-19 pounds without food and water). The weight is calculated based on the XL-sized kit. Wool or poly baselayers (winter). Hiking pants (shells in winter). Alpine Touring (AT) ski boots. Also note that the mountaineering boots and ski boots on the list above may be rented locally as “outsourced gear” if we don’t have your size (mountaineering boots only). We can even rent them on your behalf (though not recommended due to sizing), but this option does carry an up-charge of $40. To protect the gear that protects you, Gear Insurance is also available. For the Ready Pack and all its contents, the insurance for the “Ready Pack” in $10/person/day. The insurance amount for the “Alpine Ready Pack” is $20/person/day. To learn more about how our gear insurance works, please review our policies. 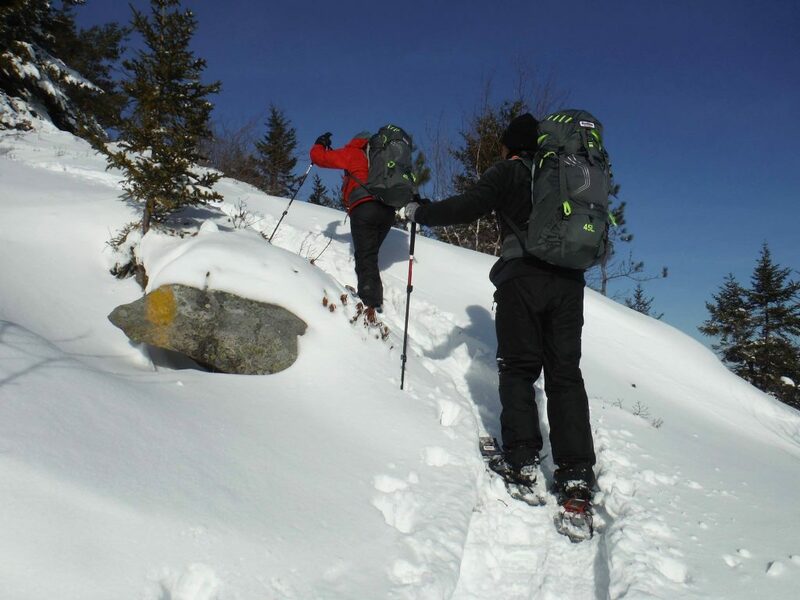 Alpine Ready Packs — including snowshoes and trekking poles — shown in use on South Moat Mountain. These are items that should be in the group or, better, carried individually. In addition to our "Thirteen Essentials," shown above, these items are also important. Backpackers should add the following items to their kit. In the winter months, especially if entering the alpine zone or into avalanche terrain, it's important to carry and know how to use even more gear, as needed.